When you have a linear model representing the portion of your Simulink® model that you want to estimate, you can use that model to generate the input signal. This alternative to manually specifying the estimation signal (as shown in Estimate Frequency Response Using Linear Analysis Tool) can be useful when you are using frequency response estimation to validate a model obtained through linearization. This example shows how to perform frequency response estimation in Linear Analysis Tool using an input signal that is based on the dynamics of an exact linearization of the model. 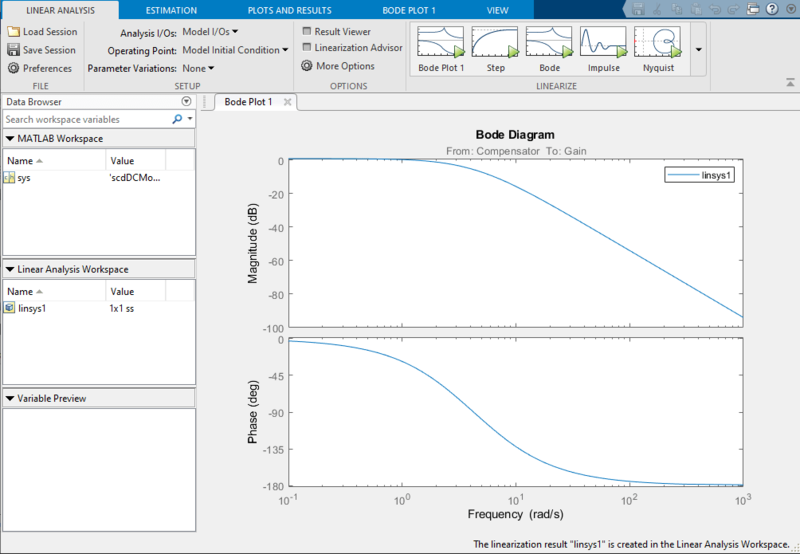 In this example, linearize a Simulink model to obtain the linear model you use to generate the estimation input signal. This model contains predefined linear analysis points. There is an input point at the compensator output and an open-loop output after the unit gain block. The response from the defined input to the defined output is the response of the inner loop of the model, with the outer loop open. Linearize the model using the predefined analysis points and using the model initial conditions as the operating point. In the Linear Analysis tab, click Bode. A new linearized model, linsys1, appears in the Linear Analysis Workspace. In the Estimation tab, in the Input Signal drop-down list, select Sinestream. Initialize the input signal frequencies and parameters based on linsys1. In the Create sinestream input dialog box, click Initialize frequencies and parameters. In the Frequency content viewer, select all the frequency points. Specify the amplitude of the input signal. Enter 1 in the Amplitude box. Create the input sinestream signal. Click OK. The input signal in_sine1 appears in the Linear Analysis Workspace. Click Bode Plot 1 to estimate the frequency response. The estimated system, estsys1, appears in the Linear Analysis Workspace and the its frequency response is added to Bode Plot 1. The frequency response for the estimated model matches that of the linearized model. You can use this approach to validate an exact linearization.